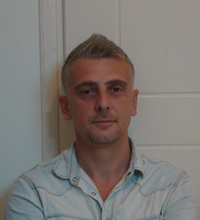 GIANCARLO IANNONE joined STARC in September 2009. He has a degree in Conservation of Cultural Heritage from the University L’Orientale of Naples, Italy, in 2006. He was previously a Fellowship Researcher at the Interdepartmental Centre of Archaeological Service (CISA), in Naples. He taught on a master's level at Naples University 2008 in “Laser Scanner application in Archaeology". He has participated in several international projects and international expeditions on the development of topographical and Laser Scanner surveys of archaeological areas and monuments.